The Transport Minister Jacinta Allan has sent a letter in response to an email from Sustainable Transport advocate John Englart for track duplication and extension of the Upfield rail line and extension of the Upfield Bike Path. The minister fails to answer any of the questions put to her in the email. “Transport Minister Jacinta Allan only offers political spin with regards to long overdue and inadequate prioritisation of upgrading the transport infrastructure for the Upfield-Craigieburn corridor.” said John Englart in response. “It is time to do the track duplication between Gowrie and Upfield and with it build the Upfield Bike Path extension”, commented John Englart. 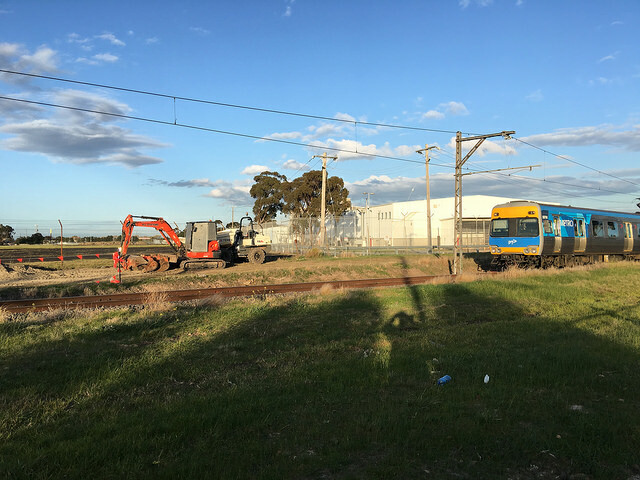 The Fawkner resident had emailed the minister regarding a $5 million feasibility study on extending the Upfield line, and doing the track duplication between Gowrie and Upfield. The 2018 budget papers detail that the study is now complete, but it has not been released to the public. Residents will rally outside Upfield Station at 11am on Saturday 3 November. Many are organising to catch the train to the protest according to the Facebook event. A group of cyclists lead by John Englart are planning to meet at the end of the Upfield Bike Path at Box Forest Road at 10.20am to cycle to the rally at Upfield, seeing exactly what the LXRA did at Camp Road level crossing removal. After the rally, the cyclists will proceed down Sydney Road through Campbellfield, a road usually seen as very dangerous for cycling upon. You can register at this Facebook event. Has this study been released? If it hasn’t been released, when will it be made public? 2. I appreciate that planning is clearly underway, but the Minister fails to give any time frame for upgrade. Will it be next year, or 15 years time, or even longer? We need track duplication now, and the extension to Craigieburn and further to Wallan should be in active planning as a priority project. It’s a matter of social equity for our northern outlying suburbs. The Northern Metropolitan Partnership Forum (Minister D’Ambrosio was present) on 15 August at Craigieburn rated Public Transport as second most important issue in the Northern Region after local jobs. : “Equitable public transport: improve public transport access, equity and use through greater funding allocation, frequency and interconnected public transport modes. 3. I asked about track duplication and the Minister totally ignored responding to duplicating the track between Gowrie and Upfield. Track duplication would increase reliability and is one of the important upgrades needed to increase service frequency. Currently when anything delays the train timetable, train services are short shunted at Coburg station which means all the people waiting further north have much longer waits. 4. My understanding is that only one staff resource has been funded for Active Transport Victoria. This is massive under resourcing when we need substantial rollout of walkability improvements and improvements to the cycling network and infrastructure. The Minister neglects to mention the $100 million is a 4 year allocation, that in the 2018 budget just $23 million allocated to cycling and walking projects, which amounted to 0.36 per cent of the transport infrastructure funding. That is miniscule when the United Nations advocates that some 20% of transport infrastructure funding should go to cycling and walking. 5. The $3.5million for Upgrading the Upfield Bike Path and extending it to the Western Ring Road is much needed, especially as this is a prominent arterial cycling route through Moreland and is rated very poorly as cycling infrastructure. It also suffers as it is a shared use path with all the probelms of pedestrian cycling conflict. The Minister should use her influence and powers to ensure a dedicated cycling veloway is included with the Bell street to Moreland Road #LevelCrossingRemoval project by the LXRA slated to be done in 2019. 6. This cycling funding also ignores that there is no safe north-south cycling route through Campbellfield, and that VicRoads has refused to provide a safe alternative to the very dangerous for cycling traffic conditions on Sydney Road at Campbellfield, despite the Upfield-Craigieburn Strategic Cycling Corridor being 200 metres away. LXRA (which the Minister for Transport presides over) stuffed up providing any cycling infrastructure between the Western Ring Road Path and Camp Road, despite their mandate to provide such paths as part of their projects. Public access has actually gone backwards due to their work. Here are the complete texts of the original email and the response from Transport Minister Jacinta Allan on Upgrade of the #Upfieldline, and in particular the $5 million feasibility study that has been completed on the Somerton line extension. 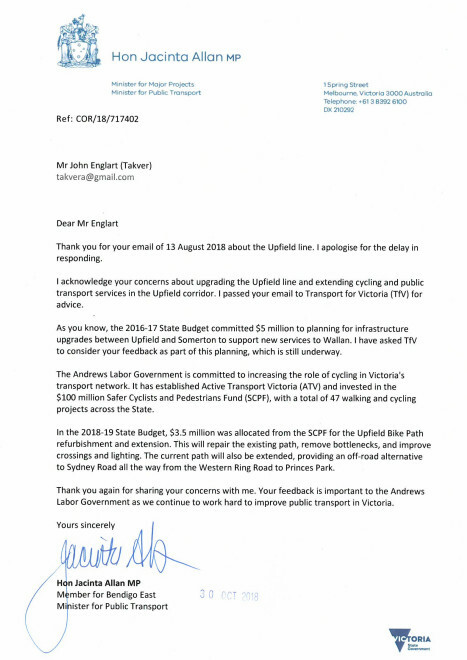 John Englart sent this brief email on August 13 asking about the $5 million feasibility report on upgrading the Upfield line and extending the Upfield Bike Path. The 2016/17 Victorian Budget provided $5 million for a feasibility study to investigate and plan for infrastructure upgrades, including track duplication for the Upfield rail line. As I have a strong interest in the upgrade and extension to cycling and public transport services in the Upfield Corridor, can I please be sent a copy of this report as soon as it is published. Thank you for your email of 13 August 2018 about the Upfield Line. I apologise for the delay in responding. I acknowledge your concerns about upgrading the Upfield Line and extending cycling and public transport services in the Upfield Corridor. I passed your email to Transport for Victoria (TfV) for advice. As you know, the 2016-17 State Budget committed $5 million to planning for infrastructure upgrades between Upfield and Somerton to support new services to Wallan. I have asked TfV to consider your feedback as part of this planning, which is still under way. The Andrews Labor Government is committed to increasing the role of cycling in Victoria’s transport network. It has established Active Transport Victoria (ATV) and invested in the $100 million Safer Cyclists and pedestrians Fund (SCPF), with a total of 47 walking and cycling projects across the state. In the 2018-19 State Budget, $3.5 million was allocated from the SCPF for the Upfield Bike Path refurbishment and extension. This will repair the existing path, remove bottlenecks, and improve crossings and lighting. The current path will also be extended, providing an off-road alternative to Sydney Road all the way from the Western Ring Road to Princes Park. Thank you again for sharing your concerns with me. Your feedback is important to the Andrews Labor Government as we continue to work hard to improve public transport in Victoria. Posted on November 2, 2018 November 2, 2018 by John EnglartPosted in Campbellfield, LXRA, MinistersTagged duplication, Jacinta Allan, somerton, Upfield.